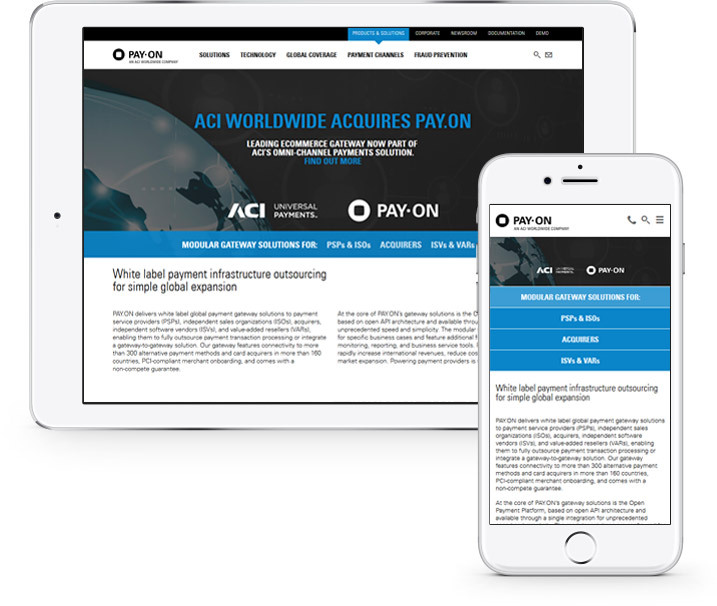 PAY.ON AG is one of the world’s leading operators of payment infrastructure systems, whose cloud services meet all of the needs and requirements of the modern and globally connected payment processing. As a white-label provider, PAY.ON guarantees its clients (PSPs, ISOs, acquirers, and financial institutions) a complete independence. The full range of the omnichannel PAY.ON platform allows users to activate an ad hoc proprietary system with all the relevant payment and fraud management processes, including global connectivity and the latest fraud and charge prevention – which can be supplemented at any time to include external tools and market-tested PAY.ON services, such as the quick merchant onboarding and mobile payment. At the core of PAY.ON’s gateway solutions is the Open Payment Platform (OPP), based on open API architecture and available through the single integration. The modular PAY.ON gateway enables the prompt connectivity expansion of existing systems via a single proprietary API. 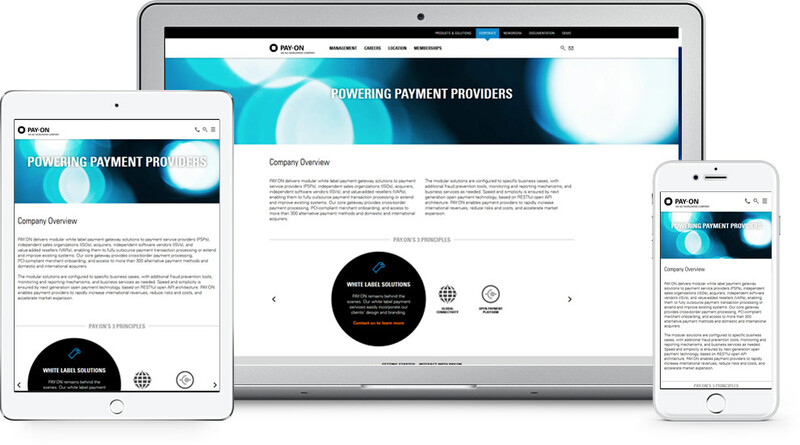 PAY.ON is also a supplier of the white label platform PaySourcing and the routing gateway PayPipe. PaySouring makes it possible for customers to outsource all relevant payment and risk-management processes, or procure them via cloud computing and thus become a payment service provider themselves. PayPipe is a high-performance payment gateway that connects all payment market participants with each other using just one interface. Using PayPipe, transactions can be processed online for all payment methods in all currencies and across all systems. International expansion presents huge opportunities for payment providers, far beyond what is possible in any single domestic market. Worldwide, e-commerce is worth more than $1.5 trillion per year and it is growing rapidly. Successful international expansion requires offering not just the right payment methods and acquiring options, but also the ability to configure them quickly and efficiently. This is what PAY.ON wanted to deliver through its global payment network. Also, PAY.ON wanted to operate with an extensive global payment network that would cover the high number of payment methods in different e-commerce markets around the world. A high-performance payment gateway that connects payment market participants throughout the world via one single interface was implemented. Using that payment gateway, transactions can be processed online for all payment methods in all currencies and across all systems. The connection to the gateway is made by using a simple API connection to the client’s system. Over 100 different payment methods with the global, continental and nation payment coverage are supported through this API – from credit and debit cards (e.g. Visa, MasterCard, Maestro) and alternative payment methods (e.g. Giropay, PayPal, instant transfer) to the region-specific system such as WebMoney or Boleto. As a routing gateway, the added process-related value of the implemented solution lies in its simplification of the entire transaction process. Instead of each provider having to set up a separate interface as is customary, this payment gateway handles all the transactions for all business partners via one API only. The implemented payment gateway supports and transfers all possible formats (e.g. XML, GICC, ISO-8583, JSON) and transaction types (including pre-authorization, capture, debit, credit, 3-D Secure, refund, reversal) in the context of electronic payment handling. Today, with the PAY.ON's global network of more than 300 alternative payment methods and card acquirers, which is expanding by four additional connections on average per month, payment providers have the technical connectivity to reach e-commerce markets in more than 160 countries. Finally, the entire PAY.ON network is available through the single open API, its integration is simple and delivery time to those markets quicker than ever.